A 120/240 VAC Genny to Charge Batteries is NOT Very Efficient. Using a 120 volt or 120/240 volt (or 230 volt) single phase generator to charge your batteries is very common, inexpensive to purchase and horribly expensive to operate. BUT you must expect to pay anywhere from $2.50 to $5.00 per kWh when using a single generator to operate your home and charge your batteries. If you are going to use a single phase generator to charge your battery bank go here to learn how to get the most charging power out of your fossil fuel powered generator. It will still be expensive to charge your batteries using a single phase 120/240 volt AC generator compared to a 3 phase alternator but the power factor correction will help significantly. All Magnum Energy inverters use power factor correction in their built-in battery chargers as well as the Xantrex RV converters to name a few. There are many more. Please check your manufacturer’s documentation. First Problem: Your generator is producing 120 or 120/240 60 hz (or 230 volt 50 hz) single phase which must be reduced to 12/24 or 48 volts with the use of a sometimes huge and inefficient transformer (which is typically seen in a large off grid system) and then be rectified later into DC. Second Problem: Single phase 120 volt power is only charging your battery bank when the output voltage is above the voltage of the battery bank. Typical single phase, 60 hertz (or 50 hz) power generators actually charge the battery bank less than half of the time the generator is running…far less. I’ll show you why. This is a typical sine wave one would expect from a good quality single phase 120 volt 60 hz power generator. Typical sine wave produced by a good quality 120 AC generator. When charging your battery bank with a 120 volt 60hz (or 230 volt 50 hz) AC generator in combination with a battery charger (either built in to the inverter or a separate unit), the first thing that happens is the voltage is reduced using a massive transformer to a voltage low enough to charge the battery bank. For the purposes of this demonstration we will assume the battery bank is a 12 volt battery bank. Now the sine wave looks like this. 12 volt AC sine wave produced using a 120 to 12 volt transformer. Next, the 12 volts AC must be rectified to DC using a single phase rectifier. Let’s take a look at the wave now and see what has happened. In a sine wave the voltage is above zero voltage half the time and below zero voltage half the time. When you rectify this sine wave, only the voltage above the zero line remains. Anything below the line is useless and gone. For you geeks the actual voltage is higher when rectified so it looks closer to this. So 50% of the power you are generating is not used to charge a battery. But wait…IT GETS EVEN WORSE! To charge a battery you need a higher voltage than the battery voltage. If you have a 12 volt battery that is almost full, the voltage might be 13-15 volts. If the battery voltage is 13.4 you will need at least 13.5 volts DC or more to charge that battery. If your battery’s voltage is only 10.5 volts (virtually dead) you will need over 10.5 volts to charge this battery. The diagram above has a black horizontal line representing roughly 12 volts. Any voltage above that line will be useful for charging a 12 volt battery bank. Any voltage below the line is useless and wasted when charging a 12 volt battery bank, unless the battery bank is extremely dead. The diagram below shows when the battery bank is actually receiving a charge. THE AREA SHADED IN BLUE REPRESENTS THE TIME THAT AMPERAGE IS GOING INTO THE BATTERIES. IT IS A VERY LIMITED AMOUNT OF TIME CONSIDERING THE GENERATOR IS CONSUMING FUEL THE ENTIRE TIME. As shown in the diagram, the only time the battery bank is being charged is the area shaded in blue. If you life off the grid and have to use a fossil fuel powered 120 volt AC or 120/240 volt 60hz (or 230 volt AC 50hz) AC generator you are likely familiar with the problems they cause. 1. They rarely make a nice clean sine wave unless you are lucky enough to own an EU Honda or similar. And while the EUs and equivalents are nice, they are less efficient than than a normal “off the shelf” AC generator. They produce wild 3 phase AC, convert it to DC and then invert it to clean 120/1240 volt AC. Every change from AC to DC and DC to AC their are losses involved. They do make up for their inefficiency by doing an excellent job of idling down when there is no load. However in this article we are talking about charging batteries with a generator, not operating a cottage or home with a generator. There will always be a significant load on the generator defeating the auto idle down feature. 2. No matter how good inverters are getting at synchronizing with the generator before flipping the auto transfer switch, the lights still dim and the fridge compressor makes a “clunka”, “clunka”, “clunka” sound which can’t be good for it. Some are so bad that your computer reboots. Fortunately the newer inverter/chargers don’t reboot computers if you have them programmed properly. About 5 or 6 years ago my brother decided we could do better and it was surprisingly simple…a small diesel (or gasoline or propane) engine was coupled to a Ford 100 amp alternator with a belt. It consumes a third to one half of the fuel a single phase generator consumes. As it is simply a DC charging source, the inverters do not have to synchronize or open and close any transfer switches. We will write an article as soon as possible about our homemade DC generator (alternator) but look at the sine wave a Ford alternator makes and think whether it would charge a battery bank better than a single phase 120 volt or 120/240 volt AC 60hz (OR 230 volt 50hz) generator. DC (direct current) is made either by solar modules or a DC generator like those used on old cars and tractors. Almost all alternating current (AC) electricity is made as 3 phase power. All utility made electricity is generated as 3 phase. They only sell you one of the phases and sell the other two phases to your neighbors. All electricity in the automotive industry is generated as 3 phase and then rectified to DC to charge 12 volt battery. All industry operates using 3 phase electricity as it much, much more efficient. THE ONLY AC ELECTRICITY THAT IS GENERATED AS SINGLE PHASE IS THE PORTABLE OR HOME GENERATOR. They are a generator all their own and are designed completely different than any typical three phase alternator/generator. Enjoyed reading about your adventures, wow ! 1000 watt pure wave inverter with my 2000 watt inverter generator ? are 2 sources ok.
Is my inverter generator also single phase ? Your saying that a Ford Alternator is better than off the shelf 3600 rpm Generators ? Thank you so much for your comment in writing to me. If your inverter has a 120 V AC 60 Hz input you may use your generator to supplement for the surge of your motor as the inverter will ananyze the voltage and frequency of your generator and synchonize with it. However if you try to connect both the output of the inverter to the output of the generator they will be at different voltages and frequencies destroying at least the inverter and possibly the generator. I’m saying that for strictly charging your batteries, maximum efficiency and longevity of your generator…a Ford alternator coupled with a petroleum or diesel is much better. This article confuses me. You seem to be saying that the problem is inherent in single-phase generators, but then go on to explain that the problem is actually with a battery charger that uses half-wave rectification. Does such a thing even exist? I can’t find a battery charger these days that uses a “massive transformer” instead of switch-mode circuitry, much less one that uses half-wave rectification. Thank you for commenting. The point of the article is that it is more efficient to charge a solar battery bank with a three phase alternator when compared to single phase generator coupled with a battery charger built into the typical Xantrex, Outback Power or Magnum Energy inverter/charger. You are correct, a typical high end battery charger purchased at an auto supply store is likely to use switch mode circuitry to reduce the voltage instead of transformers but these are usually small chargers maybe 10-40 amps. The larger models as used in an auto repair shop (maybe 100-200 amps) use a transformer and half wave rectification making them very inefficient. They are not made to be efficient, but made to be rugged and cheap. In anything larger than a small solar power system you will likely need more than 10-40 amps to charge your battery bank. The chargers on most modern inverters use transformers as they are much more rugged than solid state switching and they can use the large transformer bidirectionally. They can charge batteries as well as increase the 12/24/48 volts AC to 120/240 volts AC for their output. This makes it make sense to simply use the existing transformer for battery charging as it is already there. A Ford alternator for example converts mechanical energy to three phase 12/24/48 AC which only then needs to be rectified. A 120/240 volt generator converts mechanical energy to 120/240 VAC which must have its voltage reduced by a transformer (or switch-mode circuitry,) and then be rectified to DC adding another step making it less efficient than the three phase alternator. With real world testing I can use less than 1/2 the fuel by using a small engine coupled with a Ford alternator when compared to a 120/240 volt generator going through an inverter/battery charger unit. The other HUGE advantage is my appliances are always operating from the regulated sine wave of my inverters rather than the unreliable voltage and frequency of an “off the shelf” generator. The last advantage is my loads do not flicker when the inverter switches from inverter power to generator power as there is no such switch over. You are correct that more and more chargers are using better technology to change 120/240 VAC to 12/24/48 VDC. And yes it is very common for battery charger rectifiers to only use half of the wave. Get a oscilloscope and you can see the waveform coming from a typical RV converter or battery charger. The supposed DC “waveform” just looks like bumps above the zero voltage line; not exactly what you would expect from DC current. Jody, I have a 48 volt system that requires (bulk) voltage of 56 volts. So, not being a techie, I have some ?s about getting the right charge from a Ford 100 amp alternator. My preliminary investigation suggests that I just crank the hell out of it (9000 rpms) and the volts will rise BUT a real 48/56 designed alternator has 4X the windings and this design can be turned at normal speeds. But I have no real idea. Your system is 24 volts, no? So hw do you achieve that from an alternator designed to do 12v? Good to hear from you. I actually have a 48 volt system and use the standard 100 amp alternator. The battery is what decides the voltage the alternator puts out assuming you spin the alternator fast enough. 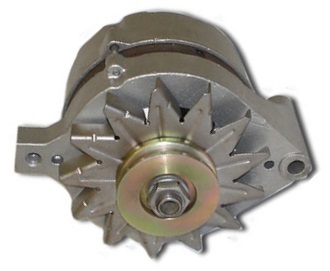 Even at normal speeds such as connected to a Ford truck engine the alternator will put out over 100 volts at a little over idle. But as it is connected to a 12 volt battery and 14.? volt regulator, it only produces 12 volts nominally. Like you said a “48 volt alternator” would have 4 windings in series but it would be limited to about 25 amps. Just connect the alternator positive to the positive of your battery bank and the frame of the alternator to the negative side of your battery bank. Next you will need to apply 12 volts to the field of the alternator (the spinning part that magnetizes when 12 volts is applied). Then you will need a rheostat to control how much of the 12 volts is applied so you can control the output of the alternator and the drag the alternator places on the engine. Somewhere between full power and off there is a sweet spot…the point where you get the most out of the alternator and burn the least fuel. If you simply apply full power to the rotor (field) it will almost certainly stall your engine unless the engine is huge..
Another consideration is the field needs to be un-energized when you start the engine until it warms up and runs smooth. This may only take 30 seconds or so depending on the ambient temperature. The rheostat you are looking for needs to handle 50 watts as the field can consume up to 30 or 40 watts. Most chargers use more than 1 diode when rectifying, your rectified sinus wave that you are showing is only using 1 diode. Most battery chargers are using 4 diodes and it is called rectifying bridge and the rectified sinus wave is looking more like your 3-phase wave and is very compatible with it. Yes, you double the power output with an rectifying bridge and you get rid of more ripples. Then the next one used is the bridge that uses 2 diodes. And the least one used is the single diode that you used to show that graph. The 2 diode and the 4 diode rectifying system will fill in the empty spaces that the 1 diode system shows. So most chargers will have more power and more steady power since they have the 4 and the 2 diode systems. I just got a yanmar Diesel engine set up for a generator. I was going to order a head to mat up to it but after reading this artical are you saying I should make a system to use an alternator? Would be a lot cheaper than buying the head!! Should I look for the highest out put? Multiple alternators? I am glad you commented. You will get for more power by using an off the shelf alternator than a 120/240 volt generator head. The other nice thing is you will not have to always make sure the engine operates at exactly 3600 rpm (or 1800 or 1200 or 900 depending on the generator head). 120/240 volt generators must run at the exact correct rpm or you will not get the correct voltage and frequency. With a Ford alternator, the faster you spin it, the more output you will get. I would need to know the following to answer the rest of your questions. How many hp is the engine? Expect about 500-600 watts per hp if you want to keep your engine a long time. How large is your battery bank? You don’t want to charge the batteries too fast or they will become damaged. Usually no more than 10-13% of your battery banks amp hour rating. 1000 amp hour battery bank, no more than 100-130 amps. How big are your inverters? or inverter? Expect to pay about $100 for a 100 amp alternator. Keep an extra in stock as they are so cheap. It will make up to 100 amps at 12/24 or 48 volts. You just need to spin it faster to get the output you want at a higher voltage than 12. Our system is 48 volts. Right now I have the alternator coupled with a 8 hp Subaru gas engine (I get 4200 watts at 48 volts) but am working on coupling it with a 1962 Lister FR1 6 hp diesel engine and also building another to work with a steam engine. There are videos of the steam engine on the website. The link is near the bottom of the list on the left navigation. I always hated the lights flickering and the clocks losing time and the fridge compressor sounding like it was going to explode every-time I started our 120/240 volt generator. And the fact that is consumed so much fuel. Thank you for the very Informative web page. I live off grid and over the years have spent a ton of cash on jennies and fuel. At this point I’m planning on about eight L16re 370amp Trojans, perhaps two strings of four. The batteries would run a small household 120v freezer, a satellite internet system & laptop, a dozen 12v led yard lights (5amp ea), and three variable speed fans ( 12v/1.5-5amp ea). Can you recommend an appropriate gas engine horse power and alternator? I have a selection of motors and alternators here, but with what you said about quick vs slow charging, I though it best to check with the pro.